First off let me say I am a fan of Isao Tomita's earlier non soundtrack works. I especially enjoyed his "Bermuda Triangle" as well as his interpretations of many classical pieces. That said, all I can say about this soundtrack is that it is somewhat bland and did not grab me at all. Most of the music is slow paced with a few uptempo tunes reminiscent of late 70's funk/disco tunes. There are also some mid-tempo tunes that sound appropriate for TV music to accompany something about Nostradamus. The music on this CD is not bad but I didn't find it particularly attractive either. A listener could put it on and use it as background music. Pleasant but innocuous. 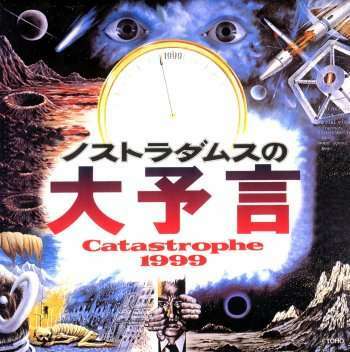 The "Catastrophe 1999" album is made up of the original mono film cues as is the current vogue. What you may not know is that there was a "proper" soundtrack album (TAM lp: AX-8804) which Victor issued as a now out of print CD (VICL-5080, coupled with a non Tomita score to 1977's "The War in Space").